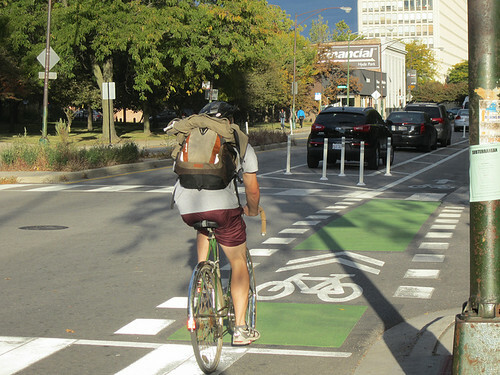 Green lanes are next-generation protected bike lanes, and they are popping up all over the U.S.
How to describe your first time in a green lane? There’s nothing quite like it. For me it happened on a business trip to Copenhagen. I saw bikes everywhere, beginning with the taxi ride from the airport where I spotted business executives toting briefcases on bikes, wanna-be fashion models wearing high heels on bikes, kids heading to school on bikes, parents pedaling toddlers to daycare on bikes, old folks chatting to one another on bikes. How do they do it, I wondered? I was a seasoned bicyclist who rode every day for commuting and recreation yet still felt tense wheeling down busy city streets. These riders looked completely at ease, even in the midst of morning rush hour with cars, buses, trucks and motorcycles all around them. I even saw one guy smoking a cigarette on a bike and others absorbed in phone conversations. Then I looked down and noticed that the bike lane was separated from motor vehicles by a divider. So that’s how they do it! I couldn?t wait to try it myself. Cycletracks invite riders of all abilities in Copenhagen. The next day I ducked out of a meeting, rented a bike at nearby shop and set forth to explore Copenhagen on two wheels. After pedaling just a block, I thought ?Wow!? and began giggling. This was an entirely new experience in biking– almost like the exhilaration of riding without training wheels for the first time. Liberated from fears of being sideswiped by motorists, I could take in the historic architecture and feel a part of the city’s teeming streetlife. There were even special traffic signals for two-wheelers, giving us a slight head start through crowded intersections. No wonder half of Copenhagen’s downtown commuters traveled by bike. 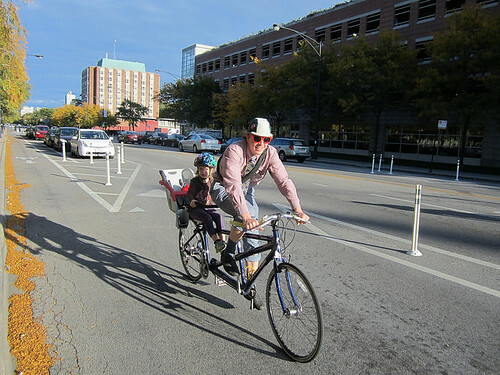 Cruising through the heart of the city, I realized protected bike lanes were good for everyone, not just bicyclists. Without them, pedestrians, motorists and bus riders would be engulfed by twice as much traffic. That, I figured, accounted for the calm courtesy I experienced from people behind the wheel. We need something like that in the U.S., I dreamed as I rode my bike back home in Minneapolis. Impossible, people would tell me, special bike lanes are strictly a European thing that would never fit in our newer, auto-dominated cities. You?re selling America short, I answered. We are an enterprising nation, dedicated to innovations that improve our lives. If we can invent the Internet, we can make biking safe for everyone. And that’s exactly what’s happening right now. Green lanes are popping up from Miami to Long Beach, Austin to Chicago, including Minneapolis. [Note: Our Green Lane Project is leading the way in implementing these.] 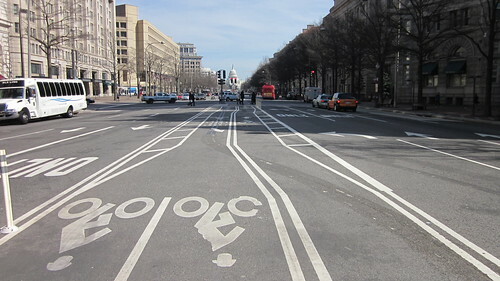 As I ride the new protected bike lanes across downtown on 1st Avenue North, I say ?Wow!? and then giggle. I can appreciate the handsome old warehouses and enjoy the bustling streetlife. I notice people in suits and in high-fashion outfits on bikes, even some teenagers and older riders. It feels even more exhilarating than the first time Copenhagen, because it’s right here at home. Washington, D.C.’s Pennsylvania Avenue green lane.